I often get the question on how I seem to have so much time and still get so much done. There’s really no secret to it. It’s a matter of prioritizing what you do. Time management is simply that. A choice in how you spend your time and what you put into each hour. It’s just like budgeting your money. If you don’t then it’s hard to know where it’s going. Understanding that allows you to make choices. Spend an hour watching TV or spend an hour exercising? We all get 168 hours in a week or more precisely 1,440 minutes in a day. Time is the only thing we can never get more of. Once gone, it’s gone. But there are things you can do that will make you feel as if you have enough time and that involves being in control of your day and schedule. I’m going to cover five of them. These habits are easy to do, but they are also easy to ignore. But if you do them, they are impactful. 1. NO cell phone or email in the morning. According to a 2013 study done by IDC Research 80% of people check their cell phone first thing in the morning. A recent Gallup study shows the frequency of checking your cell phone during waking hours range from every few minutes to a few times per hour. Talk about being addicted! And highly distracted. When you check your phone first thing in the morning, you end up not only wasting precious time you could use for other things but you end up on other people’s agenda. You may think it’s not affecting you but now you’re down the rabbit hole of busy but not productive. Action Step: Ignore the phone and email! Block out time in the morning for YOU so that you can have a nice, quiet, peaceful morning nurturing you. Decide what kind of input you want to feed your mind. Incorporate things like meditation, journaling, and exercise into your morning routine. If you rather get straight to work, get your most important tasks done first, before going down the rabbit hole of emails. That way you’ve accomplished things that help you move forward before diving into emails. 30 minutes exercising or getting your most important work tasks done vs. 30 minutes checking your phone? The choice is yours! Meditation is no longer just for monks and hippies. The benefits of meditation is real. Not only does it help you reduce stress and anxiety, but meditation can help increase your focus, help you gain clarity and balance. Action Step: There are both guided and non-guided meditations. If you’re new to meditation I suggest starting with an app like Calm or Headspace. Another great resource is YouTube that have some fantastic guided meditations. Oh, and if all this sounds too granola for you remember Fortune 500 CEO’s, Oprah, pro-athletes and other highly successful people accredit meditation to much of their success. Everything you do today has an effect long-term. I wrote a blog post called Accumulative Effect you can read HERE. Your body is your temple and if you don’t take care of it, then both your energy and productivity goes down the drain. Exercise is an energy-booster. Plus when you feel and look good you feel more confident. And when you feel better about yourself you get more stuff done! Richard Branson who started the Virgin empire accredits exercise to his success. In an interview he said he easily gains four hours of productive time a day by exercising! Your brain use more energy than any other part of your body and if you don’t fuel it well it can’t operate at an optimal level, which means it takes you longer to get stuff done. Feed your brain good nutrition so it can help you stay focused. Avoid energy drinks, soda, fast food and all the processed crap that makes you into a sluggish blob. Action Step: Make exercise and eating healthy a priority in your life. But I don’t have time to exercise or cook healthy food you say. Really? How much time a day are you wasting on checking social media, watching TV, or watching silly cat video’s? 4. Live in a proactive mode instead of a reactive mode. Plan ahead! I know, what a concept! A little bit of planning ahead goes a long way. That 5-10 minutes of planning will not only save you precious time in the morning or during the day but it will also help to preserve precious brain power you can use for more important things and decisions. Action Step: Decide the night before what to wear the next day. Lay out exercise clothes. Pack lunches. Decide beforehand what to eat for both breakfast and dinner. Take a little time in the evening to make a plan for the next day. Including what you want to accomplish the at work so when you get there you can hit the ground running. Make it a goal to live in proactive mode instead of reactive as much as you can. 5. Get plenty of rest, sleep and incorporate breaks. You’re a human being, not a robot! Did you know that if you are sleep-deprived you operate on about 40% of your brain capacity? Talk about wasting precious resources. Also, if you are constantly in a sleep-deprived state of mind it’s the same as being intoxicated. You’re literally drunk! All because you’re not getting your 7-8 hours of sleep. Action Step: Make sleep a priority. Shut off electronics an hour before going to bed. Meditate if needed to slow down your brain to relax. During the day, take breaks to recharge. Go for a walk. Take a power nap. Meditate. Step away from work and let your brain recharge. Eat a healthy snack. Do something different to break up the monotony. When you’re tired your brain goes into negative thinking mode and what you’re trying to accomplish will just feel harder. Okay, there you have it! 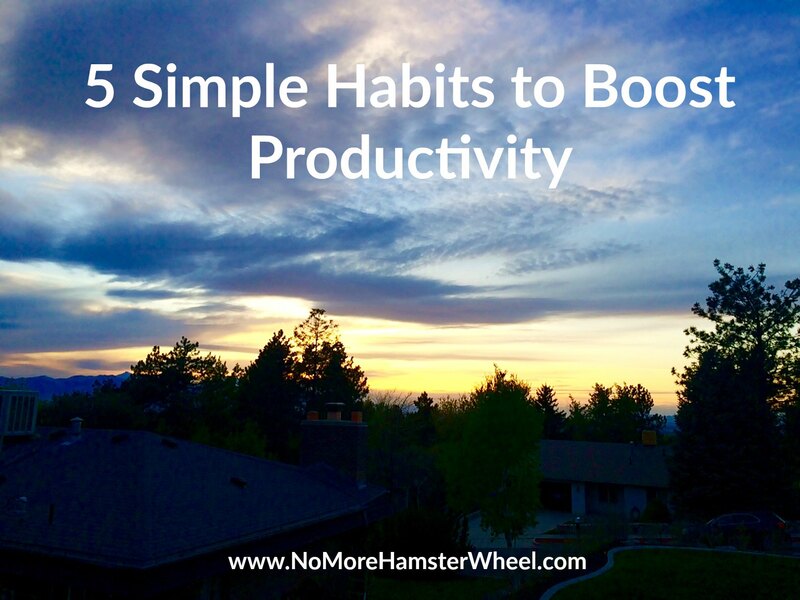 5 simple ways to gain more time, be more productive, control your day and feel more empowered. If you incorporate those you are going to see some great changes. The secret? You got to do them and stick with it! If you want to do more, be more and live more, you have to take the time to incorporate success habits into your life. Rome wasn’t built in one day so if you fall off the wagon, get back on it. Small changes on a consistent basis lead to great leaps. Which habit are you going to incorporate immediately today?